When one robber barron tried to buy the NYC&StL from another, the price was quoted so high that the phrase was said ...your rails must be plated in Nickel... and it stuck as the Nickel Plate Road! Now part of the NS RR. The famous Nickel Plate No. 765, restored and running at numerous railfan events. A 2-8-4 Berkshire at its finest. This image is when she was owned and operated by the NKP RR. So authentic, you just may hear her chugging along. 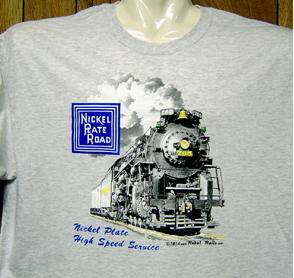 The famous Nickel Plate American Locomotive Co "PA" passenger diesel locomotive on a light grey/ash T-shirt. A gorgeous design you will be proud to wear. The Nickel Plate 2-8-4 steam locomotive No. 765 has been on active duty almost since built. This 11 oz mug features a beautiful image of the famous 765 in all her glory. On the reverse is an image used on the NKPs stock certificates. Coffee Mug featuring Nickel Plate Roads fast and famous American Locomotive Company "PA" streamlined passenger diesel. 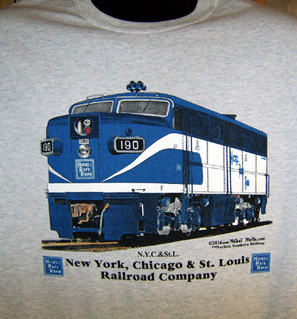 Coffee Mug featuring Nickel Plate Roads logo superimposed over the paint scheme of its diesel locomotives. A very unique way to present the railroads logo. 6 inch x 6 inch square tin logo sign of the Lake Erie & Western Railroad. Controlled for a time by the NYC, then sold to the Nickel Plate Road, now part of the NS Rail System. License Plate featuring the classic Nickel Plate Road logo. 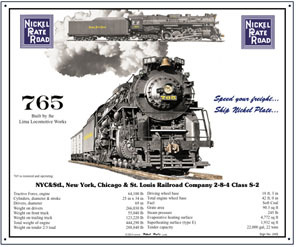 Speed your freight, ship Nickel Plate was one of their tag lines. Mouse pad featuring the beautiful Nickel Plate Roads No. 765 when she was owned and operated by the Nickel Plate RR. 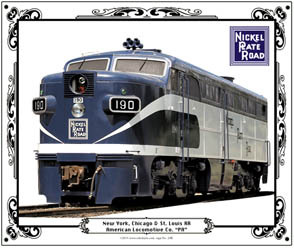 Mouse pad featuring the beautiful Nickel Plate Roads ALCO build PA passenger diesel. Mouse pad honoring the new NKP Heritage diesel operated by the Norfolk Southern Railroad. 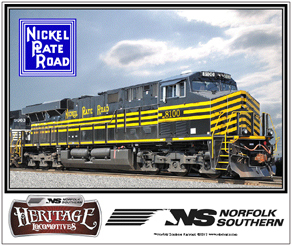 NKP diesel joins Norfolk Southern Railroads Historic diesel fleet. 6 inch x 6 inch square tin sign of the historic NKP Heritage diesel. A powerful locomotive paint scheme. 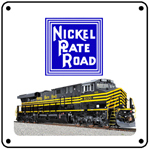 6 inch x 6 inch square tin logo sign of the Nickel Plate Road. Informative 10x12 inch metal sign of the Nickel Plate Roads beautiful no. 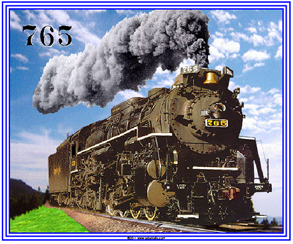 765 steam locomotive, with builders photo and specifications. 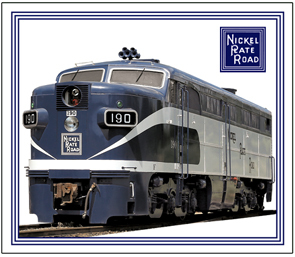 Metal sign with the beautiful and massive American Locomotive Company PA passenger diesel in Nickel Plate colors.